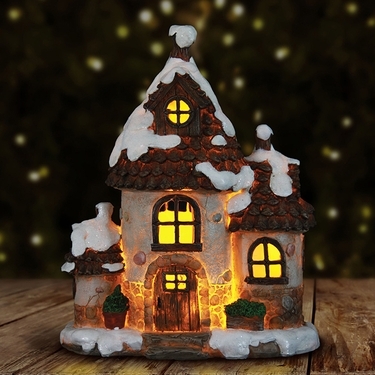 This charming holiday cottage is dusted with snow and lit by LED lights, making a joyful addition to your holiday decor. Feel the warmth and joy of creating your own holiday village! The timer will illuminate the LED lights at your desired hour every day. Timer technology lights up the statue automatically every day. Lights up for 4 hours every day. Multiple LED's for added brightness. Requires 3 AA batteries (not included).